Identifying and monitoring one own’s knowledge and performance gaps while implementing strategies, including the use of evidence based medicine and reflection, to close these gaps. Develop an understanding of the ways IDPs are used by medical trainees and physicians for personal and professional growth by watching this video. Explain the components of an IDP after reviewing this slide set (presentation has a voice-over, please download presentation and open in PowerPoint to hear audio). Use this IDP template throughout your medical education. This entry was posted in Lifelong Learning, Patient Care, Professionalism on February 8, 2019 by somehm. This entry was posted in Communities, Interventions, Lifelong Learning on February 8, 2019 by somehm. Optional: Read this brief article on strategies that will make reflection effective as you become a physician. This entry was posted in Interactions, Lifelong Learning on February 8, 2019 by somehm. 1. Watch the video Understanding and Preventing Cognitive Errors in Medicine through 10:05. GOAL: Think about instances when you have witnessed or employed cognitive bias that has led to error. INSTRUCTIONS: Actively watch the video and think about how we use dual system processing and cognitive bias in everyday life and clinical practice. 2. Read the vocabulary list below. GOAL: Think about examples of each type of bias. INSTRUCTIONS: Compare and contrast different types of cognitive biases Several are often employed together. Anchoring: the tendency to perceptually lock on to salient features in the patient’s initial presentation too early in the diagnostic process, and failure to adjust this initial impression in the light of later information. This bias may be severely compounded by the confirmation bias. Availability: the disposition to judge things as being more likely, or frequently occurring, if they readily come to mind. Thus, recent experience with a disease may inflate the likelihood of its being diagnosed. Conversely, if a disease has not been seen for a long time (is less available) it may be under-diagnosed. The availability cascade occurs when a collective belief becomes more plausible through increased repetition, e.g. ‘I’ve heard this from several sources so it must be true’. Framing effect: how diagnosticians see things may be strongly influenced by the way in which the problem is framed, e.g., physicians’ perceptions of risk to the patient may be strongly influenced by whether the outcome is expressed in terms of the possibility that the patient may die or that they might live. In terms of diagnosis, physicians should be aware of how patients, nurses and other physicians frame potential outcomes and contingencies of the clinical problem to them. The following cognitive biases may also contribute to faulty decision making and medical errors. Base-rate neglect: the tendency to ignore the true prevalence of a disease, either inflating or reducing its base-rate, and distorting Bayesian reasoning. However, in some cases clinicians may (consciously or otherwise) deliberately inflate the likelihood of disease, such as in the strategy of ‘rule out worst case scenario’ to avoid missing a rare but significant diagnosis. Blind Obedience: showing undue deference to authority or technology. This can occur when an individual or team defers to the opinion of the consultant or to the findings of a radiologic study, even when it doesn’t make sense with the clinical picture. Blind spot bias: the general belief physicians may have that they are less susceptible to bias than others due, mostly, to the faith they place in their own introspections. This bias appears to be universal across all cultures. Commission bias: results from the obligation towards beneficence, in that harm to the patient can only be prevented by active intervention. It is the tendency towards action rather than inaction. It is more likely in over-confident physicians. Commission bias is less common than omission bias. Confirmation bias: the tendency to look for confirming evidence to support a diagnosis rather than look for disconfirming evidence to refute it, despite the latter often being more persuasive and definitive. Diagnosis Momentum: once diagnostic labels are attached to patients they tend to become stickier and stickier. Through intermediaries, (patients, paramedics, nurses, physicians) what might have started as a possibility gathers increasing momentum until it becomes definite and all other possibilities are excluded. Fundamental attribution error: the tendency to be judgmental and blame patients for their illnesses (dispositional causes) rather than examine the circumstances (situational factors) that might have been responsible. In particular, psychiatric patients, minorities and other marginalized groups tend to suffer from this bias. Cultural differences exist in terms of the respective weights attributed to dispositional and situational causes. Information bias: the tendency to believe that the more evidence one can accumulate to support a decision the better. While gathering sufficient information is always important, it is also important to anticipate the value of information and whether it will be useful or not in making the decision, rather than collecting information because we can, or for its own sake, or out of curiosity. Mere exposure effect: the development of a preference for something simply because you are familiar with it. Also known as the familiarity principle, it can have widespread effects in medicine, e.g., merely seeing a pharmaceutical product or being told about it may increase the likelihood of choosing it over other products. Need for closure: the bias towards drawing a conclusion or making a verdict about something when it is still not definite. It often occurs in the context of making a diagnosis where the clinician may feel obliged to make a specific diagnosis under conditions of time or social pressure, or to escape feelings of doubt or uncertainty. It might be preferable to say instead that the patient’s complaint is ‘not yet diagnosed’ (NYD). Omission bias: the tendency towards inaction; rooted in the principle of non-maleficence. In hindsight, events that have occurred through the natural progression of a disease are more acceptable than those that may be attributed directly to the action of the physician. The bias may be sustained by the reinforcement often associated with not doing anything, but may prove disastrous. Omission biases typically outnumber commission biases. Posterior probability error: occurs when a physician’s estimate for the likelihood of disease is unduly influenced by what has gone before for a particular patient. It is the opposite of the Gambler’s fallacy in that the physician is gambling on the sequence continuing, e.g., if a patient presents to the office five times with a headache and is correctly diagnosed as migraine on each visit, it is the tendency to diagnose migraine on the sixth visit. Premature closure: is a powerful bias accounting for a high proportion of missed diagnoses. It is the tendency to apply premature closure to the decision making process, accepting a diagnosis before it has been fully verified. The consequences of the bias are reflected in the maxim ‘when the diagnosis is made, the thinking stops’. Search satisficing: reflects the universal tendency to call off a search once something is found. It is pervasive and considered one of the most important sources of error in radiology. Comorbidities, second foreign bodies, other fractures, and co-ingestants in poisoning may all be missed. Sunk costs: the more clinicians invest in a particular diagnosis, the less likely they may be to release it and consider alternatives. This is an entrapment form of bias more associated with investment and financial considerations. However, for the diagnostician, the investment of time, mental energy and, for some, ego may be a precious investment. Confirmation bias may be a manifestation of such an unwillingness to let go of a failing diagnosis. Visceral bias: the influence of affective sources of error on decision-making has been widel underestimated. Visceral arousal leads to poor decisions. Countertransference, involving both negative and positive feelings towards patients, may result in diagnoses being missed. • Fatigue, sleep deprivation, or other distractions may tip the physician toward retreat. Any one or a combination of these reasons may result in a failure to pursue the initial hypothesis. This entry was posted in Lifelong Learning and tagged Lifelong Learning on January 2, 2018 by raburns. This session begins an exploration of thinking about thinking. Nobel laureate Daniel Kanhneman deserves credit for the title- he published Thinking, Fast and Slow in 2011. In our quest to become master clinicians, it is paramount we explore all aspects of clinical reasoning. This session introduces the thought process behind conscious and unconscious bias and how it may influence the way you think about clinical problems and patients. A brief note on bias. The Oxford English Dictionary (OED) defines bias as “Cause to feel or show inclination or prejudice for or against someone or something.”  As you read the below articles and participate in the in class discussion consider how these theories of thought contribute to how fast or slow you arrive at conclusions. Over the course of EHM we will continuously refer to Type I and Type II thinking. An understanding of these fundamental thought processes can improve not only your clinical reasoning but your interactions with patients and peers. Actively watch this introductory video on Dual Process Theory. Compare and contrast system 1 and system 2. Read entire article, paying particular attention to the highlighted portions. Begin to think about how the 2 systems interplay in clinical decision making and how physicians must rely on both. This entry was posted in Individuals, Lifelong Learning and tagged Lifelong Learning on January 2, 2018 by raburns. Metacognition: Thinking about thinking; Knowing about knowing; Being aware of your awareness. It is a self-regulatory process that monitors and evaluates your own cognitive processes. Metacognitive practices help you identify your own strengths, weakness and limitations so that you can identify strategies to expand your knowledge or skill level. We do not learn from our experiences by simply having them. Reflection on action allows us to gain understanding and learning from the experiences we have had. 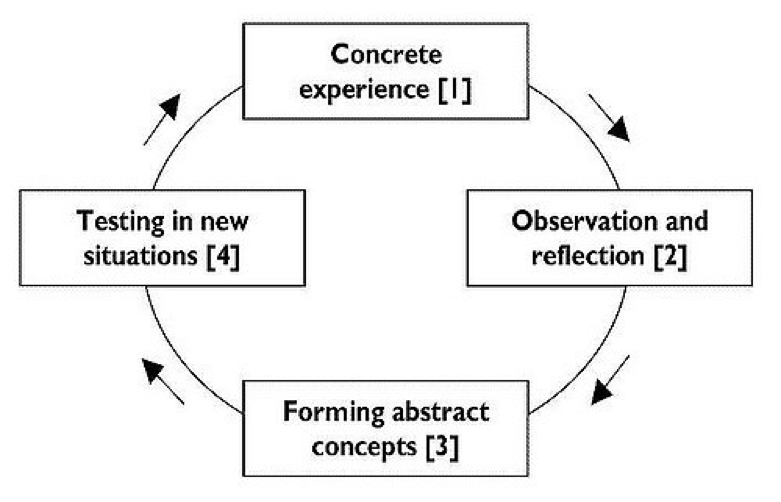 The Adult Learning Cycle by Kolb (1984) is one way to conceptualize the steps we take to learn from our experiences. Reflection on action is a key piece. Figure 1. The adult learning cycle by Kolb. Courtesy of www.infed.org/biblio/b-explrn.htm. You reflect back on that experience. You may identify actions you took or reactions you had and the consequences or outcomes. You analyze and try to understand why you took those actions and/or where the reactions came. You hypothesize about how they led to the consequences. You think about how you may apply these concepts to other situations and identify any learning needs you may have to close a gap in your knowledge or skills. You plan how what you will do next time you are in a similar situation based on your conclusions from Stage 3. You take an exam assessing your knowledge of cardiovascular drugs and receive a score below what you expected. You reflect on your study strategy which included making flash cards to test yourself on the mechanism of action, half-life and side effects of each medication. The test, however, required you to select appropriate drugs based on clinical scenarios. While you are confident with the pharmacokinetics and the mechanism of action of the medications you think you might not have gained a deeper understanding of the down stream effects on the patient’s physiology. You think that understanding drugs at this level will likely be applicable to other systems, as well. You make a plan that next time you lean about a drug you will consider how the medication will affect physiology and what the down stream effects may be. You will also identify clinical problems that would be treated or managed by these effects. You are taking a history from a teenage girl. During the social history portion, you ask her if she has a boyfriend. She crosses her arms, becomes quiet and participates minimally in the rest of the interview. You reflect on the conversation and identify that her behavior and engagement changed when you asked her about the boyfriend. You also recalled that you did not inquire whether she had romantic or sexual relationships with females and wonder if she felt isolated or judged after asking only about male “boyfriend-type” relationships. You hypothesize that some people may feel uncomfortable answering closed ended questions with limited presented options. You consider that you may be applying your own or other societal norms to your questions that may feel alienating to the patient. You make a plan that next time you are taking a social history, you ask open-ended questions when inquiring about sexual orientation, gender identity, relationships and family structure. Consider implementing a self-reflection process into your educational routine. 2. What could be improved upon? 3. What will I do differently next time? To gain a deeper understanding add a “Why?” between each step. Sandars J. The use of reflection in medical education: AMEE Guide No. 44. Medical Teacher. 2009;31:685-695. This entry was posted in Lifelong Learning on September 17, 2017 by mspin.